Providing transportation to Hollókő. Taxi, Bus, Limousine Service. Transfer from/to Budapest - Hollókő. 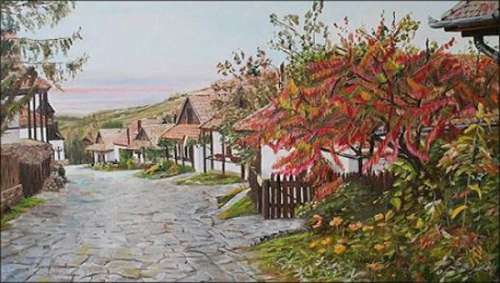 Attractions Hollókő - Original Folklore Hungary. Hollókö, the most beautiful gem in the gently rolling Palóc scenery, has been a World Heritage Site since 1987. 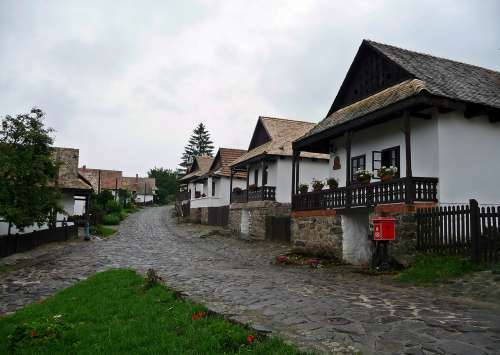 The embracing slopes of the Cserhát hills have protected the small houses hiding in a valley from the gales of history, so the village has been able to preserve its authentic charm. Hollókö is the treasure of Palócland, and it presents the uniform Palóc style of architecture in an intact form. The most precious part of the village is the central area with 58 protected buildings, which preserves masterpieces of 17th century vernacular architecture. The local ethnic Palóc people lived in the same houses for several generations. 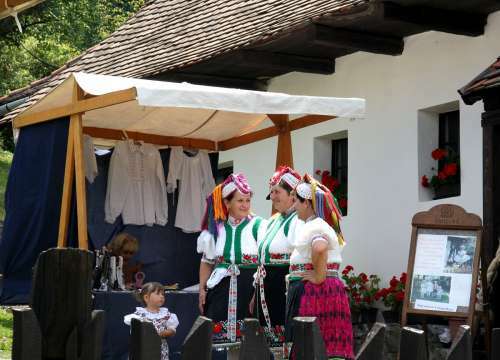 The houses were built on undivided, long and narrow plots, and this style of life remained unchanged for centuries because of the relatively isolated nature of North Hungary. The houses usually have three main parts (front room – porch – bedroom), and they are surrounded by porticos facing the street and the back yard. They were built on top of cellars, which compensate for differences in ground level and give the whole building an image of harmony. On the narrow plots pantries were built next to the houses, while the pigsties and sheds were further back in the yards. Stables for large animals were at the end of the village, in the so called Valley of Stables. The buildings that you see today were constructed after a great fire in 1909, but they still retain their authentic atructure and the atmosphere of bygone ages. Some written documents of the church date back as far as 1343, but the mediaeval church building was destroyed in the 16th century during the Turkish occupation. This present Roman Catholic church building, with adobe walls and a wooden tower on stone foundations, was built in the 19th century. Its characteristic wooden tower with a spire that provides a landmark for the village, was built in 1889. Its precious treasures are a carved statue of Piety from Upper Hungary, a flag from the 17th century and a crucifix – presents from the Esztergom Museum of Christianity. Hollókö is a village with local Palóc people who still cherish their traditions and use their richly ornamented traditional costumes. The full costume probably first took shape in the 1870s and 1880s, after which it gradually evolved. The style of garments that you can see nowadays dates back approximately to the 1930s. Men wore tight black trousers, embroidered linen shirts and felt waistcoats adorned with embroidery. Around their waists they wore black satin embroidered belts onto which they attached colourful ribbons. They also wore black circular felt hats and boots. Women's clothes with many short skirts were more characteristic, and much more decorative. On weekdays a woman only wore two pleated linen underskirts reaching just below her knees, and her bonnet, adorning her head, was also without fringes. However, on Sundays and holidays she had seven or eight petticoats under a decorated silk or cashmere outer skirt. Young girls wore as many as fifteen or twenty pleated petticoats. Women wore richly embroidered, small black silk aprons or pleated aprons over their skirts. The costume was completed with a cambric or lace bodice and a shawl adorned with colourful tassels. In olden times girls wore their hair in plaits decorated with small ribbons. Married women wore bonnets with beaded small shawls under them. They wore lacquered boots on their feet, and five or six strings of beads around their necks. The ruins of the castle, breathing history, dominate the countryside. From the mediaeval walls one can look around to see the small plots on the old vineyard, which remind everybody that the people of the village created lasting beauty even when they were working hard to earn a living. The area was the property of members of the Kacsis dynasty, who were descendants of the first ruling Hungarian Árpád royal house. After the Mongolian invasion (1241-42) King Béla IV ordered fortifications to be built to protect the people of the area against the plundering Mongolian warriors. 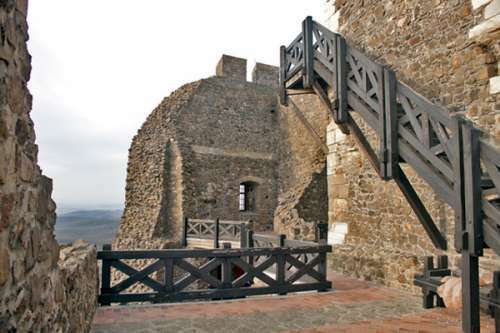 Members of the Illés branch of the family began to build the old tower of the castle, rising over the village, in the middle part of the 13th century. In 1313 King Charles Robert gave the castle of Hollókö to the local nobleman Tamás Szécsényi, and it is this period when it was first mentioned (1310) in a written document with the name "castrum Hollokew". The castle was captured by the Turks in 1552. During the Ottoman occupation of 150 years it was held by Turkish and Hungarian forces alternately, but neither side considered it important enough to fortify it. The Polish king Jan Sobieski liberated it finally from Turkish rule in 1683, but by that time the fortification had lost its function of defence. It became deserted, and the abandoned castle slowly fell into decay. 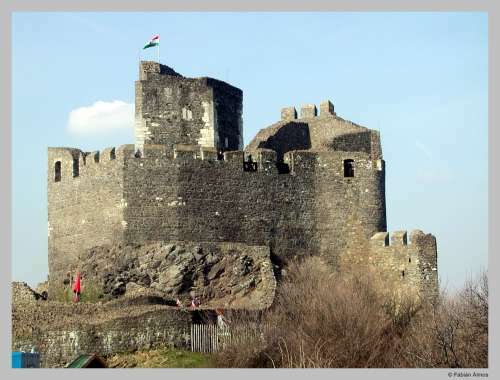 The Habsburg ruler Leopold I issued a decree in 1701, ordering the demolition of fortifications in Hungary, In 1711 the work of destruction reached Hollókö, but the castle was already in a rather dilapidated state, so it was not blown up. 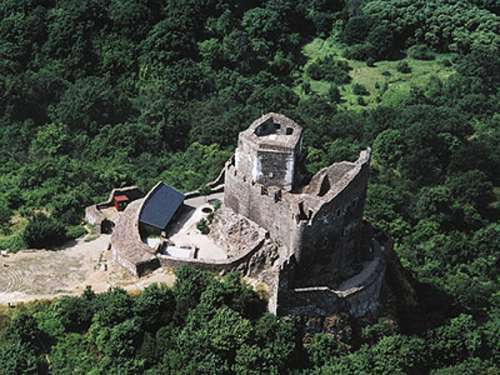 That is why the castle of Hollókö remains the most original 13th century fortification in Nógrád County. According to an ancient legend András Kacsics, ruler of the Pusztavárhegy stronghold, kidnapped a beautiful girl whose nurse happened to be a witch. In order to set the girl free, the witch nurse made a pact with the devil himself. On the devil's orders his sons took the form of ravens and stole the stones from the castle. The stones were used to build the castle of Hollókö on the site where it is now. Its reconstruction was finished in 1996. In the two sheds in the outer castle bailey visitors can see an exhibition presenting the history of the castle, the researches and the work of reconstruction. Between 1961 and 1968 a team of experts headed by Ferenc Mendele made an exhaustive study to determine the best way of protecting Hollókö. 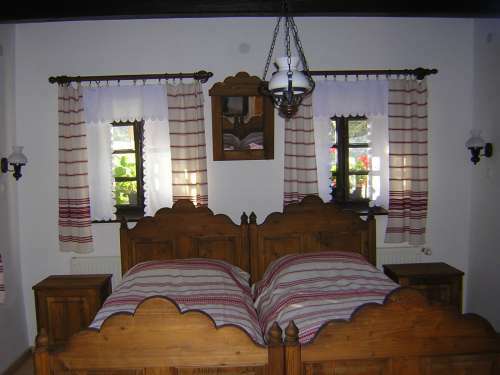 Its purpose was to preserve the authentic character of the houses which were put to new uses. The old buildings which now house the Mayor's Office, the post office, the kindergarten, the medical surgery, the Hollókö Public Foundation and the "Tourinform" office, which provides information for visitors, have successfully retained their traditional character. The protected landscape of Hollókö includes a meadow used for raising young trees, which is a significant feature of the countryside, and the vineyard with its narrow plots. Since 1977 the centre of the village, the gardens, the meadow around it and the castle hill have been part of the Hollóko Landscape Protection Area of 141 hectares. In 1987 the UNESCO World Heritage Committee awarded the title of "World Heritage Site" to Hollókö for its unique and unmatched harmony of the man-made and natural scenery. 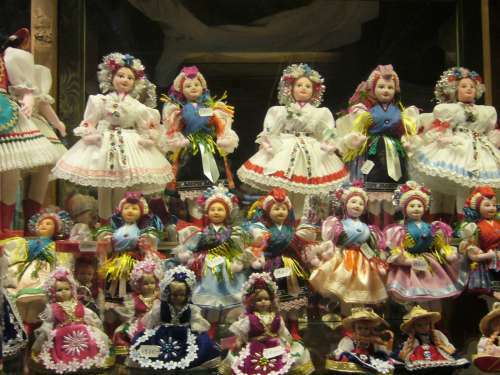 Palóc people still cherish their traditions and use their richly ornamented folk clothes. The full costume probably first took shape in the 1870s and 1880s, after which it gradually evolved. The style of garments that you can see nowadays dates back approximately to the 1930s. Men wore tight black trousers, embroidered linen shirts and felt waistcoats adorned with embroidery. Around their waists they wore black satin embroidered belts onto which they attached colourful ribbons. They also wore black circular felt hats and boots. Women's clothes with many short skirts were more characteristic, and much more decorative. On weekdays a woman only wore two pleated linen underskirts reaching just below her knees, and her bonnet, adorning her head, was also without fringes. However, on Sundays and holidays she had seven or eight petticoats under a decorated silk or cashmere outer skirt. Young girls wore as many as fifteen or twenty pleated petticoats. Women wore richly embroidered, small black silk aprons or pleated aprons over their skirts. The costume was completed with a cambric or lace bodice and a shawl adorned with colourful tassels. In olden times girls wore their hair in plaits decorated with small ribbons. Married women wore bonnets with beaded small shawls under them. They wore lacquered boots on their feet, and five or six strings of beads around their necks. 3176 Hollókő, Kossuth u. 96. 3176 Hollókő, Petőfi u. 2. 3176 Hollókő, Kossuth u. 82. Csoportoknak: 2000 Ft/diák csoport és 5000 Ft/felnőtt csoport. 3176 Hollókő, Kossuth u. 94. 3176 Hollókő, Kossuth u. 99-100. Hollókö, the most beautiful gem in the gently rolling Palóc countrysidehas been a part of the World Heritage since 1987. The forests covering the hills are native there. Now it is very rare to find any Turkey oak ("cser" in Hungarian) from which Cserhát Hills ("slopes with Turkey oak) got their name, but their original habitat can be reconstructed. Now the most common trees are the different species of oaks, mainly sessile and downy oaks. There are also some hornbeams and maple-trees with a very few northern red oaks, as well. The forests of spruces and acacia have been planted artificially. Under the sessile oaks one mainly finds garland chrysanthemums, peach-leaved bellflowers or yellow bedstraws. The vegetation on the southern slopes of the andesite hills is primarily composed of oak trees, European cornels and different shrubs, while the northern hillsides are covered by sessile oaks. The forests of hornbeams and oaks in the valleys and on the mild hills are rich in different types of mushrooms: e.g. golden chanterelle, boletus and penny bun. In the valleys and on the meadows one finds different plants, mainly meadow fescue, sweet vernal grass, geranium and autumn crocus. The verges of Hollókö are made varied by meadows with seed trees in them, and little woods of hornbeams, maple-trees and different types of oaks. The most typical plants in the undergrowth are briar roses, hawthorns, cornels and blackthorns. The stock of game in the Cserhát forests includes some large animals like roe deer, red deer and wild boar, and there are also many foxes, badgers, ferrets, weasels, forest dormice and hazel dormice living here. The bird life of the area is very rich. Here hikers often see falcons and buzzards, and once in a while even eagles. The forests also provide a habitat for common and long-eared owls, jdifferent species of thrushes, titmice and larks, woodpeckers and cuckoos. The national network of hiking routes includes Hollókö, and a leg of 15 Km runs through the Hollóko Landscape Protection Area. When walking along the "Castle" study trail hikers get acquainted with the flora and fauna of the area.